The new 2016 Toyota Tacoma is a polarizing truck. 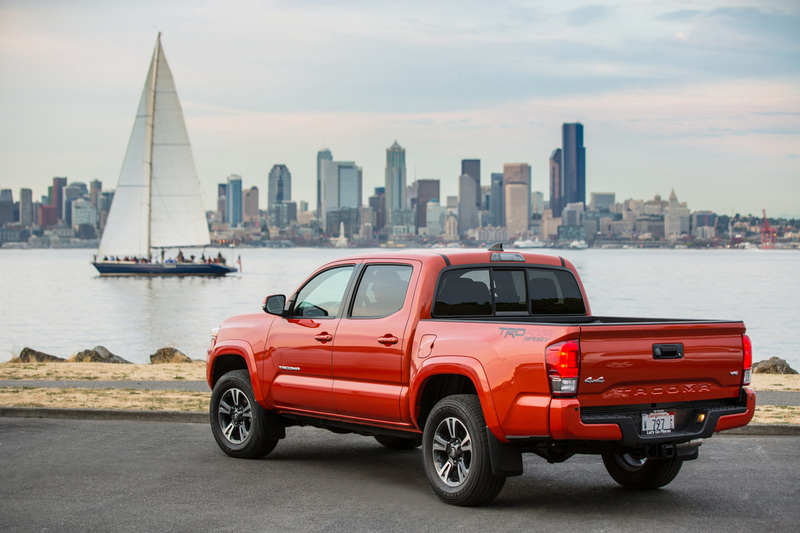 It’s still the best-selling midsize pickup, but the new body style and changes under the skin have some feeling that the all-new Tacoma might have entered the market behind the times. 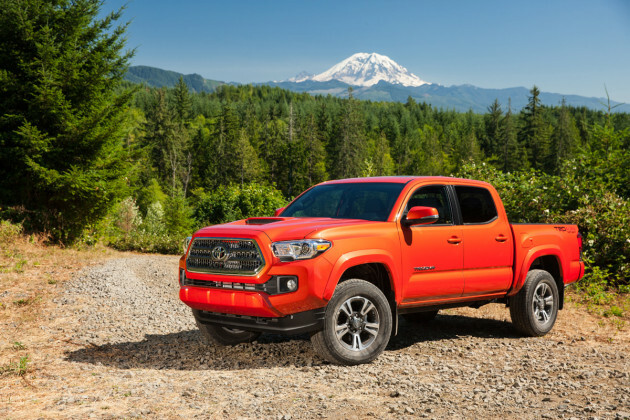 Well, after spending time in both the most popular entry-level and most popular mid-level trims for the truck, we can say for certain that the new Tacoma is not behind the times. In our opinion, the best package for the 2016 Tacoma is, dollar for dollar, the TRD Sport trim level. It comes with a lot of goodies, rings in at about $35,000, and has great offroad credibility for most people’s needs. Unless you’re constantly out playing Moab warrior in your truck, you don’t need anything more than is offered in the excellent TRD Sport package. Plus it looks cool and has enough interior comfort and tech to make it a good daily drive. On a personal note, I can say that I’ve driven all of the midsized trucks on the market. The Nissan Frontier is a good little truck, but it’s falling behind the times with its very outdated interior and low fuel economy. The Chevrolet Colorado and its GMC twin the Canyon are good trucks, but they really push the limit on what “midsize” means and don’t have the offroad package that these other trucks offer. The 2016 Toyota Tacoma was unveiled in Detroit as a brand new design for the truck. And while many things have changed, a few things remain. The size, weight, and footprint of the Tacoma are basically the same, so it hasn’t grown or beefed up. 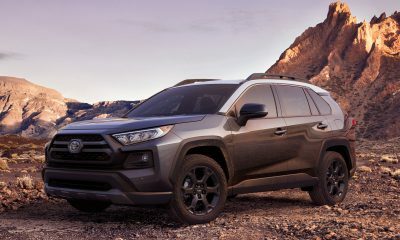 The most immediate change noticed is the exterior styling, which is much more rugged, taking several cues from the beefy Toyota Tundra full-sized truck. 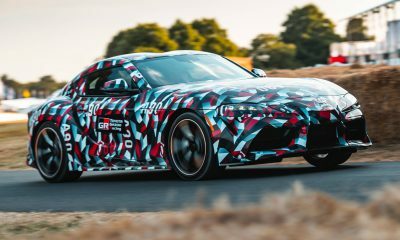 The body panels are squared, the fenders bulge in layers, and the front end has thinner, more sinister headlamps and a strong approach angle to the lower fascia. Another change is in the stance, with both the 4×2 and 4×4 models having the same height and wheel well clearance. This new look is polarizing, to say the least. From many angles, we really liked it. But from others, it looks a little overdone. 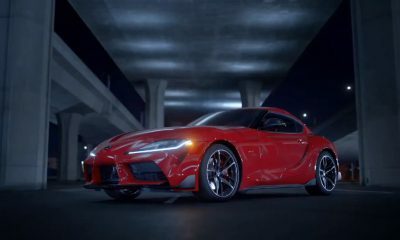 The flat hood and odd bulges of the front fenders mean that from the front, looking downward, a strange bent appearance is seen. Still, it’s a bold new look for the Tacoma and it’s got a lot of appeal. Another major change is under the hood. The 2.7-liter four-cylinder option is still there in SR and SR5 trims. The V6 is the better way to go, of course, but it’s now a 3.5L engine instead of a 4.0L. That might seem like a downgrade, but it’s actually a big upgrade for this truck, as the 4.0L was a little rough in running and didn’t have the output or fuel efficiency to justify its bulk anymore. 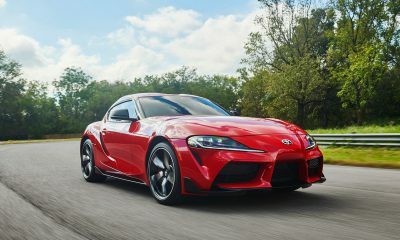 The 3.5-liter engine, based on the same 3.5 used in many Toyota vehicles, is more refined and raises output to 278 horsepower and 265 pound-feet of torque. 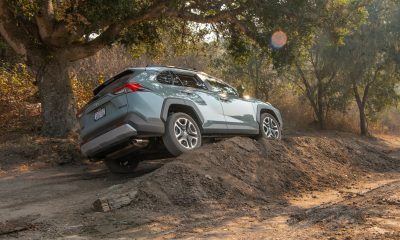 Fuel economy improves as well, at a more wallet-friendly 21 mpg combined for the 4×2 models and 20 mpg combined for the 4x4s. These assume the automatic transmission is opted for. The manual lowers MPG numbers a bit. 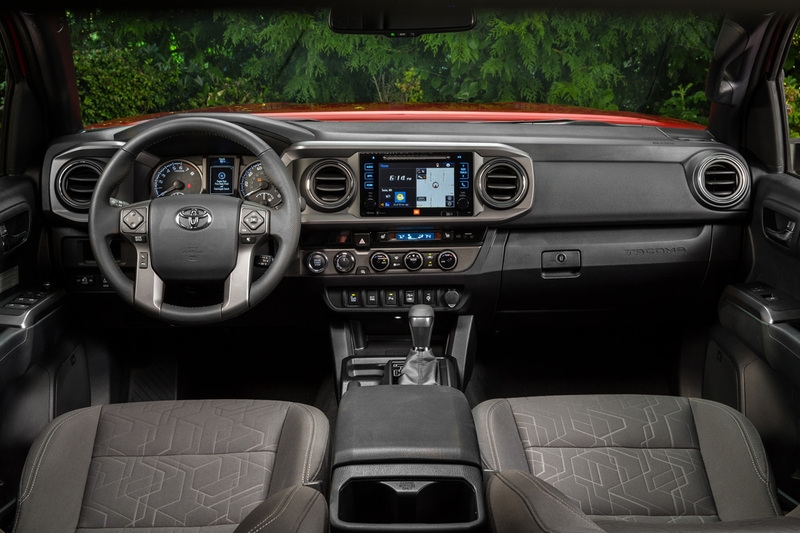 The interior of the 2016 Tacoma sees a lot of change for the better as well. We drove the Tacoma SR5 model briefly at an event this fall and were impressed at how nice it was for the price. 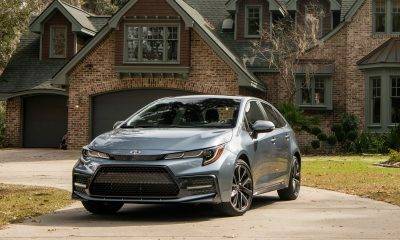 There aren’t any whizzbangs or gadgets in that trim point, but it’s competent for what it is at that more entry-level price. Our week-long press loan was in a TRD Sport model, which is much more realistic for most buyers who want a daily truck. The TRD Sport includes the cool hood scoop, 17-inch alloy wheels, sport-tuned shocks, a 120-volt power outlet in the bed (on/off switch in the cab), keyless entry and ignition, and an infotainment system, which includes a 7-inch touchscreen using Toyota’s Entune App Suite with HD radio and navigation. A rearview camera and parking sensors are also included. 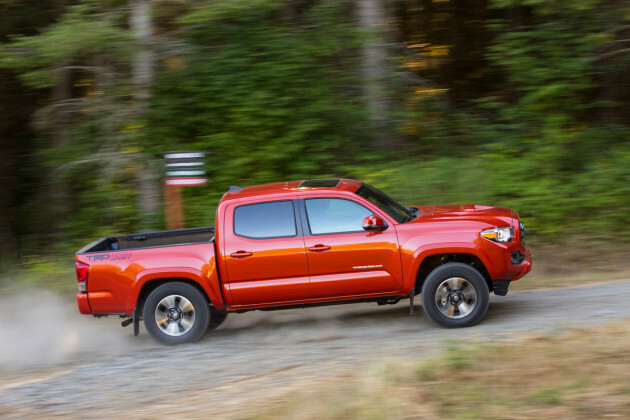 In terms of comfort, the 2016 Toyota Tacoma hasn’t changed any in its road drive. The engine sounds beefier when pressed and the truck accelerates well with that V6, but it’s still a pickup truck and it rides like one. It’s not unnecessarily rough, per se, but it isn’t your mom’s Cadillac either. 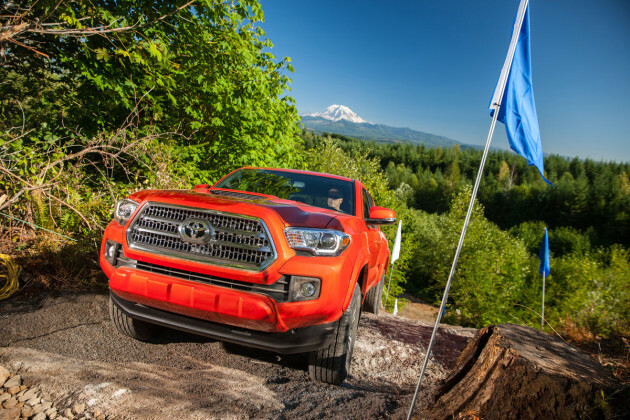 Our overall assessment is that the 2016 Tacoma is a great pickup and we feel that Toyota hit the mark with it. We weren’t sure what to think of it until we got our hands on it, but now we’re convinced that it’s going to remain the top-seller in the midsized truck segment and deserves to do so.